Plants improve the quality of the air and filter out dangerous toxins, bio effluents, and chemicals, airborne microbes (like mold spores), and they offset low humidity since the boost the air moisture. Moreover, there are plants that release oxygen during the night and day as well, and these should definitely be placed in the bedroom. Most plants largely uptake carbon dioxide and produce oxygen during the day (photosynthesis) and uptake oxygen and release carbon dioxide during the night (respiration). Yet, some can uptake carbon dioxide during the night as well as they are able to perform a photosynthesis type known as Crassulacean Acid Metabolism (CAM). Sleep deficiency and sleep difficulties are common these days, and they lead to various side effects. People who experience sleep issues try to solve their problem by drinking sleeping remedies, changing the mattress, relaxation and meditation techniques. This plant is the best air cleansing plant you can have in the bedroom. According to the tests conducted by the NASA, the spider plant purifies around 90% of the potentially cancer-causing chemical formaldehyde from the air. This dangerous ingredient is often included in common household products, such as fillers, adhesives, and grout, and released by plywood, tobacco smoke, fabrics, paints, stain varnishes, furniture, and so on. The plant also absorbs fumes and odors and promotes better sleep as it sustains oxygen levels. This plant also has the ability to convert CO2 during the daytime to oxygen at night. 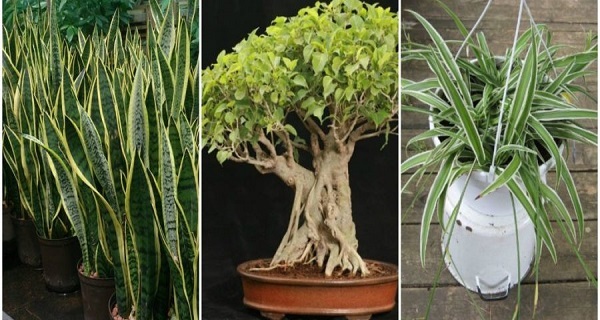 Therefore, place a few plants in the bedroom, and they will purify the air, and remove formaldehyde from the air which is emitted in the home environment. Ficus religiosa or known as the Peepal tree, sacred fig, or Bodhi tree, uptakes Carbon dioxide during the night but is also bale to perform the Crassulacean Acid Metabolism. It is native to Southeast Asia, southwest China, India and the Himalayan foothills. It might be occasionally grown in frost-free areas as an ornamental shade tree.